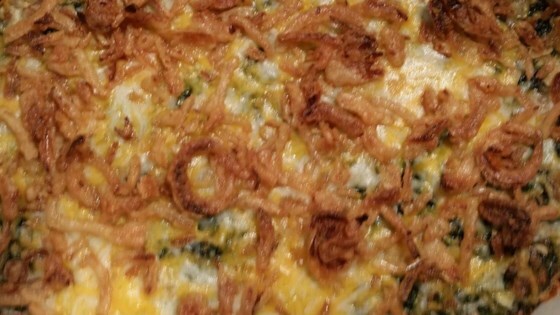 "This dish is a great vegetable side dish that my Grandma used to make. I used to hate spinach before I tried this dish and now I love it and make it for guests!" Preheat oven to 350 degrees F (175 degrees C). Grease sides and bottom of an 8 inch square baking dish. In a large bowl, mix together the cottage cheese and eggs. Stir in spinach, salt, nutmeg, and 11/4 cups of shredded Cheddar cheese. Mix until well blended. Spread evenly into prepared pan. Bake in preheated oven for 45 minutes, or until firm. Remove from oven, and sprinkle with remaining cheese. Allow to rest for 5 minutes before serving. pretty good - the cottage cheese was a bit weird - maybe ricotta would be better. It's NOT a souffle, more like a block of spinach mixed with cheese. Souffles are supposed to be fluffy, this was a lead weight and nothing but a plateful of cheesy spinach. Fine . Nice with Hollandaise Sauce over it served with some Shrimp on the side. Grandmothers always have the best recipes! This one was fantastic! I will definitely be making this one again!